We’d love your help. Let us know what’s wrong with this preview of They Serve Bagels in Heaven by Irene Weinberg. To ask other readers questions about They Serve Bagels in Heaven, please sign up. THEY SERVE BAGELS IN HEAVEN: One Couple's Story of Love, Eternity, and the Cosmic Importance of Everyday Life is based on the true life story of Irene Weinberg, whose husband Saul died next to her in a tragic car accident. The amazing messages Irene received before, during and after the accident contained a Directive from Heaven, opening her to a profound Spiritual Awakening that took Irene on a healing journey from devastating loss to a renewed sense of inner strength, spiritual wisdom and passion for life. After reading this funny, touching and inspiring eternal love story, you will gain comfort, solace and wisdom from its healing messages about love, crossing over, past lives, what heaven does about evil, soul mates, healing both in heaven and on Earth and more. You will surely both laugh out loud and weep when you read this earthy, humorous and magical story. As THEY SERVE BAGELS IN HEAVEN embraces you, it will change your perceptions about today and give you hope for tomorrow. A healing salve for your soul! Wouldn't it be the most terrible feeling in the world to survive a tragic car accident only to find out that your spouse died? I know for a fact I can't even fathom my spouse to leave this earth without me. But sure enough Irene found this out first hand when her husband Saul passed away in a car accident that she survived. This book has to be read with an open mind, I guess you could say because it involves mediums and things of that sort. I for one don't agree with things such as these. With that being said, I felt really bad for the main character. I would be beside myself if I were to lose my precious husband. The author did a very well thought out and well researched story, so I commend her for that. This is purely the authors commentary and opinion and should be taken as such. otherwise a very delightful read especially something a little different than what I normally review. The love between the couple moved me. Channeled information from Saul about his life between lives process sounded and felt accurate to me based on my experiences and on research I've read. I will caution you that Weinberg will draw you in with st Weinberg is a skilled author, writing about a subject that has fascinated me personally since I was a child, and professionally since my own talents smacked me in the face. In a good way. Reading her book was like sitting down for a good girlfriend chat. I was impressed by Weinberg's advice about how to choose a true medium, and enraged when I read that one of the mediums she hired tried to control her by telling her that her husband's soul would be in jeopardy if his widow didn't do what they said. It doesn't work that way. It really doesn't. I wasn't expecting to like the book due to my own bitterness of relationships in my life but sometimes you have to stop and listen. This is book of how we see the connections of a couple that continue to find each other and feels each other's pain when they go through life. It is amazing that in each reincarnation it was discussed of how the woman chose to live her life. It isn't campy love it is mutual respect and growth through difficult time based on the time period and that when you are mean I wasn't expecting to like the book due to my own bitterness of relationships in my life but sometimes you have to stop and listen. This is book of how we see the connections of a couple that continue to find each other and feels each other's pain when they go through life. It is amazing that in each reincarnation it was discussed of how the woman chose to live her life. It isn't campy love it is mutual respect and growth through difficult time based on the time period and that when you are meant to be you will always find one another. I have a quote stuck in my head from comedian Julia Sweeney's autobiographical show God Said Ha! "What if Heaven is just an instant?" Whether it is, or it isn't, I am in no hurry to discover, but this book is a sweet, tender story of what happens after. And for those who haven't experienced this kind of profound and tragic loss, what happens instead. The cosmic importance of everyday life: Live life consciously. Be kind to everyone. That message is transcendent. It has no religion, no tribe, no own I have a quote stuck in my head from comedian Julia Sweeney's autobiographical show God Said Ha! That message is transcendent. It has no religion, no tribe, no owners. It is universal. WOW, what a Ride! ! ! The information in this book is not only life changing, it can and probably will be earth changing! This is a fabulous book! It's a little hard to follow in the beginning, but comes together really well about half way through and finishes with a huge lift to humanity! Word of warning, this book is a little bawdy and irreverent, but I love it! They Serve Bagels in Heaven is an inspiring, thoughtful, and moving story. The author has a wonderful sense of humor that makes the book easy to read. Overall, it’s a beautiful and uplifting story that will leave you thinking. I loved this book; it reflects the views and theory I have long ago come to accept as the reality of life. Finally to have confirmation of such is wonderful. Kudos to Irene and Saul to have the courage to write it, the language to explain its complexities, the love of empowering others, and to be the mirror through which the beauty of the Universe can divulge itself. An absolute must for anyone pondering those Universal mysteries. Here is an excerpt from my review: "Full disclosure: you really have to read this book with an open mind. 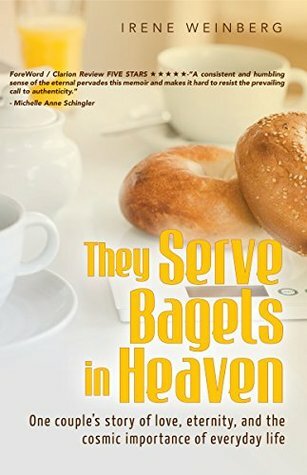 If you don't believe in mediums, psychics, or reincarnation, and you know that nothing is going to change your opinion, then Irene Weinberg's book They Serve Bagels in Heaven is not going to be the book for you." Thank you for asking me to review this book. I enjoyed it, but I thought you were putting too much of your own ideologies into it. Very politically correct. I had an out of body experience as well and enjoy reading about others experiences. Recommend. Lovely story. There are many ideas to ponder about our life on Earth and the afterlife. Irene helps us understand the true meaning of life and what we should do to make the most of it. I highly recommend this book. Not something I normally would read. It was a quick read and has me thinking about the afterlife and doing a little soul searching myself.